I love using real maple syrup in my baking. It can be used as a replacement for sugar, but in this recipe it’s used in addition to brown sugar. It makes for a sweet, sticky treat! The filling reminds me a little of what you find in a butter tart (another addiction of mine). I guess it’s somewhat similar, but instead of using corn syrup, maple syrup is used instead. I only buy the real maple syrup. It’s a little more expensive, but the taste makes up for the extra money you spend. It’s so worth it. 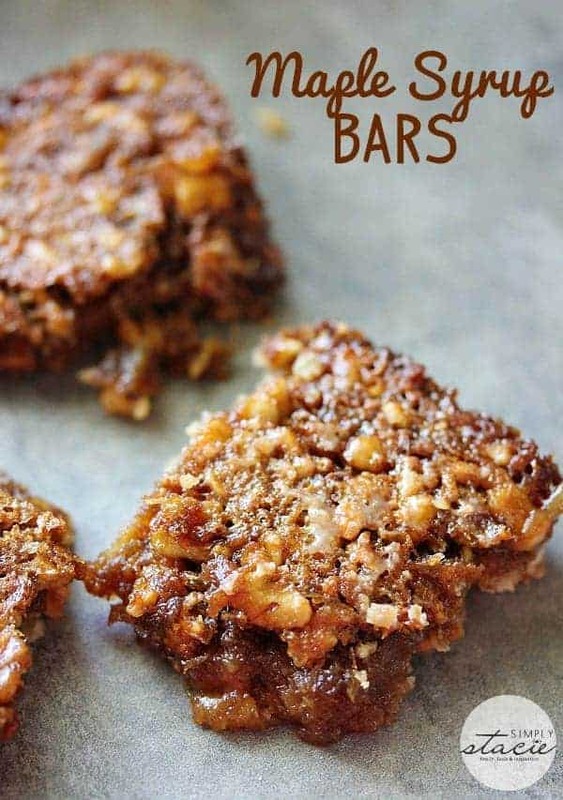 These bars are pretty easy to make. You don’t any fancy candy thermometers or even an electric mixer. It’s a couple steps because you have to bake the crust first, but even still it’s certainly not hard to make. They cut into squares much easier when they are completely cool. If you jump the gun and try and cut a piece while they are still warm, expect a little bit of a mess! I couldn’t wait to try one and it was so good, but got all over the place! How often do you use maple syrup in your baking? 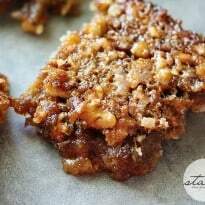 Sweet and sticky recipe for Maple Syrup Bars made with real maple syrup. Preheat oven to 350°F. Combine butter, brown sugar and flour and stir until the mixture is crumbly. Press mixture into an 8 inch baking pan. Bake for 10 minutes. Remove and set aside. 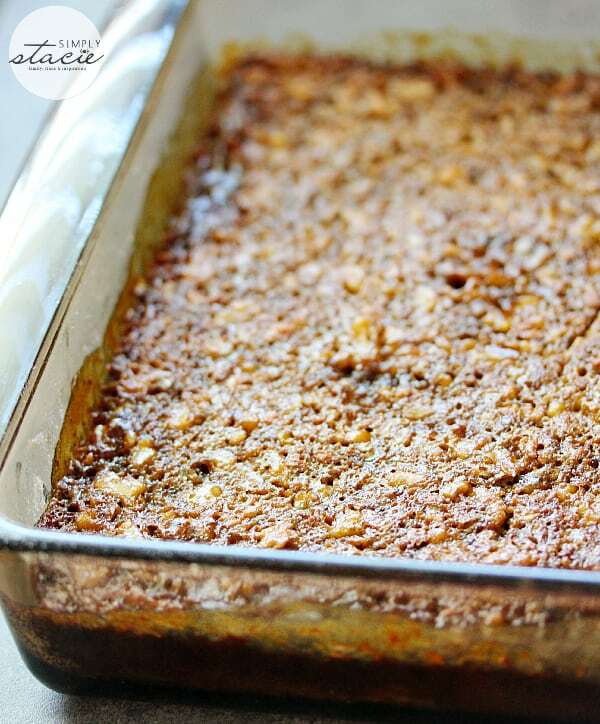 In a saucepan, combine the maple syrup, brown sugar and walnuts and bring to a boil. Reduce heat and cook over medium-low heat for 5 minutes. Remove from heat and add butter and stir until melted. In a bowl, beat the eggs with the flour and salt. Add egg mixture to maple syrup mixture and stir to combine. Pour over the base and bake for another 25 to 30 minutes, or until set. Cool completely before cutting. These look so good. I would love to make these as an after school treat for my nephews. These must be delicious, can you mail me some lol. 🙂 I’ve never tried them before. This is the first time I saw a recipe for Maple Syrup Bars and I have lived in Canada all my life!This recipe should be right up there with beaver tails . Anyway I am so glad to find it and will definitely try it with some real maple syrup. These look so yummy have to try them. These look delicious. I will have to try them. OMG these look absolutely mouth watering! I LOVE real maple syrup. What could be substituted for the nuts? You can leave the nuts out and it will be fine.